When visiting Ilocos Norte, one couldn’t miss the famous Malacañang of the North as part of their itinerary. Open from 9am to 5pm from Tuesdays to Sundays, busloads of tourists mostly from Metro Manila visit the two-storey mansion which was once the official residence of the Marcos family in Ilocos Norte, with no less than the late strongman Ferdinand E. Marcos personally designed combining a mixture of both Spanish and Ilocano designs. 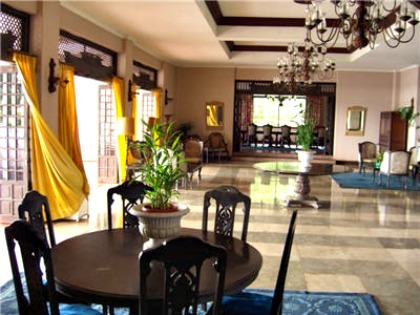 Seated on a five-hectare property overseeing the legendary Paoay Lake in Suba village, the Malacanang of the North locally known as “Malacanang ti Amianan” was built in 1976. The imposing structure is a replica of the presidential palace in Manila, a sports complex and a golf course. Following the launching of Ilocos Norte’s Paoay kumakaway tourism tagline in early 2012, the newly refurbished Malacanang ti Amianan now forms part of the Marcos Trail, as one of the prominent historical landmarks in the province. The Marcos trail as part of the provincial tourism’s campaign program promotes the Marcos birthplace in nearby Sarrat town—a two-storey stone house “Bahay na bato” now turned into a museum featuring the great Ilocano women and mother traditions, the old Marcos Hall of Justice in Laoag City where Marcos was detained in this hall after being accused of a political killing of which he successfully overturned with himself as his own lawyer and the Ferdinand E. Marcos Presidential Center in Batac City, an ancestral house of the Marcoses that showcases how the late president was made as a leader and honors his remains in an adjacent mausoleum. Letty Buduan, 54, one of the eight regular staff at the Malacanang ti Amianan said tourists visiting this site have been increasing over the years. For example, from the period of March 31 to April 20, at least 26, 615 were recorded with a minimum entrance fee of Php 30 per adult and Php 10 for children. Children below 5 years old are free of charge. The fees collected are being deposited in a trust fund under the provincial government of Ilocos Norte. It may be recalled that the Malacanang ti Amianan is one of the properties of the Marcoses sequestered by the Philippine Government when former President Marcos was removed from power in 1986. In 2010, the national government under the Philippine Tourism Authority later on turned over the management to the provincial government. For Ilocos Norte governor Imee Marcos, the Malacanang ti Amianan remains her favorite tourist destination in Ilocos Norte for this serves as a living testimony of her family’s master piece and the memories of her childhood.